July 2012 – CREATE. PLAY. TRANSFORM. When was the last time you created something between your hands? You may have tried working with paper, cloth, rubber, paints, metal, or wood. What about clay and glazes? 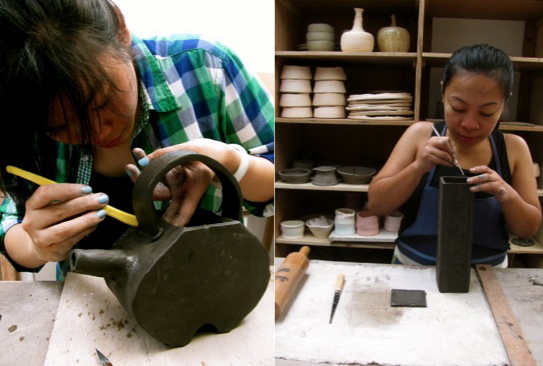 At Clay Ave Pottery Studio, you will learn the Basics of Hand Building and Wheel Throwing. All works will be glazed on the last session. Clay Ave is located in a backyard of a home in Quezon City. You are very welcome to come in flip flops, sneakers, and very comfortable clothes. In fact, I highly suggest that you wear clothes that can get dirty with clay. Cleaning your clothes after the class is not going to be a problem. Muddy clothes can be cleaned easily with soap and water. Students, who have completed the Basics in Hand Building, are now enjoying the fun with the potter’s wheel! They come to the studio and they know, that they will get their hands all muddy! Kids as young as ten years old already know how to create pots with wheel throwing. Senior citizens make sure to join the fun too! They love making pieces that they can use for food and pots for home decor too. It’s never too late to learn something new! Come to Clay Ave Pottery Studio. It’s been a place where people from all ages come to get their hands dirty with mud. 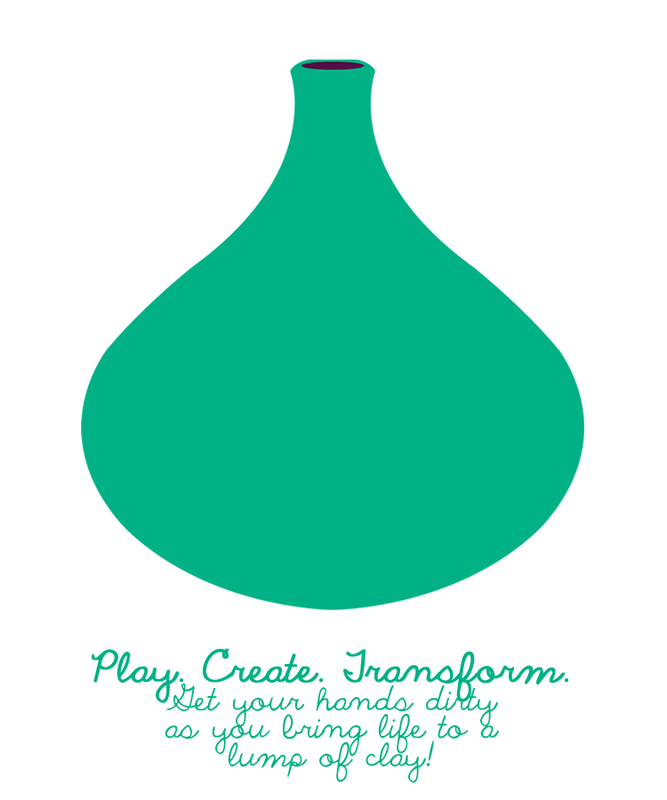 Create with your own hands. Play with mud all you want. Transform a lump of clay to life! Pottery classes in Manila will resume in August 2012. Do you like to join the fun? I have good news for you. You get a 5% discount just by your willingness to join! 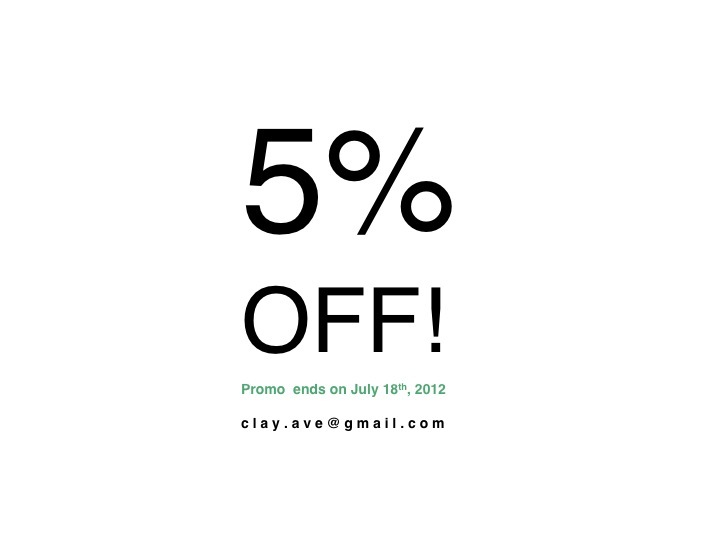 Promo runs until July 18th, 2012. Promo For Pottery Lessons In Manila! Clay Ave Pottery Studio is closed from June until July. Classes will resume on August 8th. Slots are starting to get filled. For more inquiries, please send an e-mail to clay.ave@gmail.com Visit http://clayave.weebly.com to see the schedule, policies, etc. Promo runs until July 18th. I am hoping to see old and new students in August!